i have this one little corner in my kitchen that needed a little something. but forget about getting another thanksgiving decoration, as they are null and void right now cuz santa land has taken over at most stores. 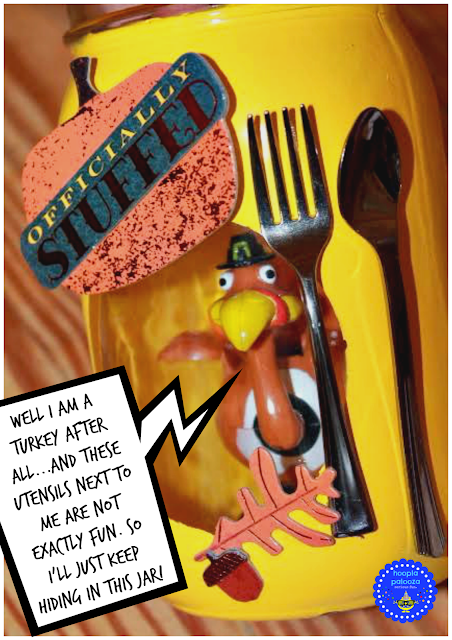 so being the crafter i am, i just went to dollar tree and found a little solar powered turkey that i made into a craft. 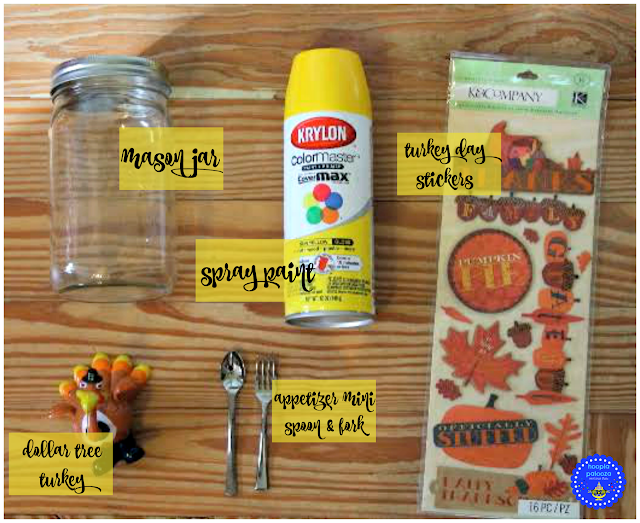 here's the stuff you need besides a large circle sticker, a hot glue gun and washi tape. i just cut a circle out of some sticker paper i had but contact paper will work too. 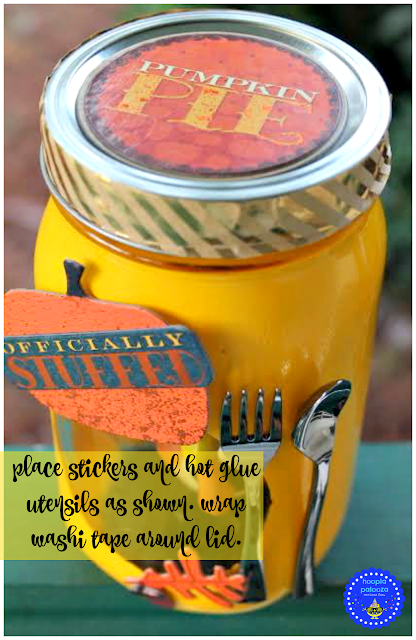 just be sure to size it like a plate according to the size of your jar you use. 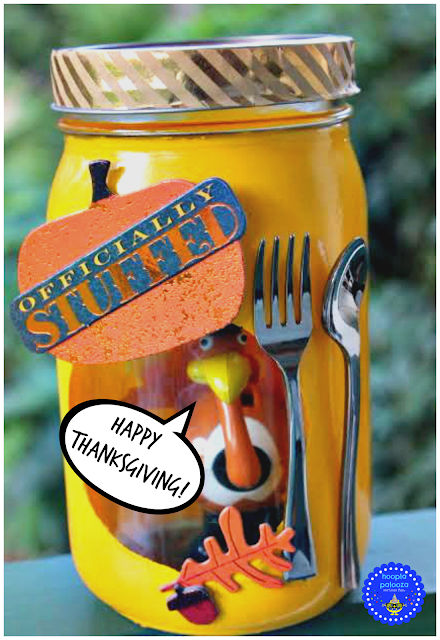 that pumpkin pie sticker is a little off topic but it was the perfect fit for the lid. 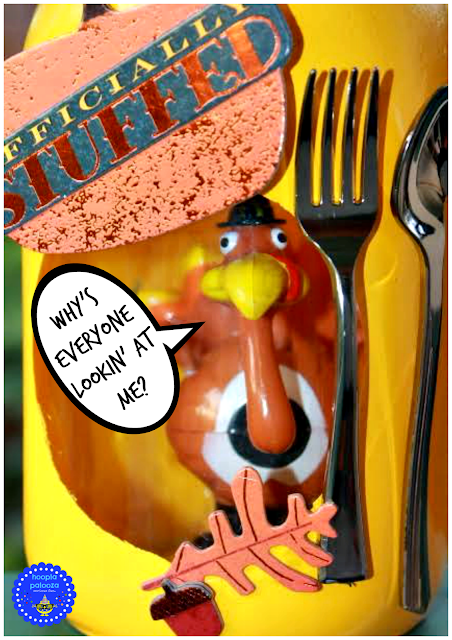 well maybe cuz you're a turkey. i mean, don't you just LOVE thanksgiving? well, at least he's got some holiday spirit!? HOLY HECK! how hilarious! how hid hou hoo hat? oops i mean how did you do that? it is obvious i need a thesaurus from Dollar Tree too Dona! but who am i kidding as i think your comment should go in the Commenter's Hall of Fame my BBFF!!!! yes along with the tenacious temperament too! LOL LOL LOL :>D!!! Cute idea! I love his cozy safe place! And boy are you right about Dollar Tree! Went in there last week and TG was GONE! ALL of it! Santa had arrived with a BLAST so there is no chance of me getting a cute lil turkey like this til next year! Aww, this little guy is so cute! Happy Thanksgiving! LOL! Love It! Thank you for sharing ! Pinning and tweeting to share. 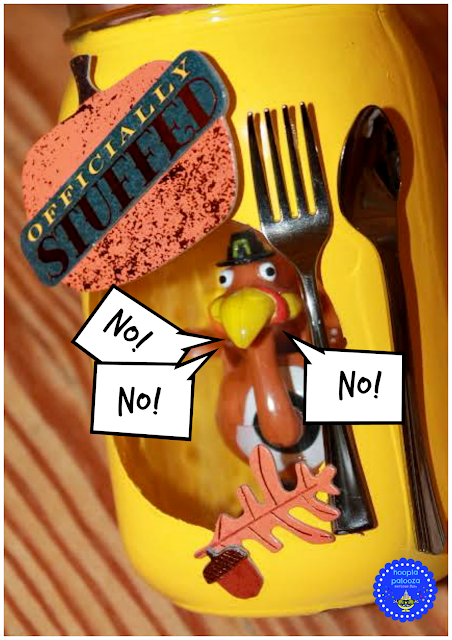 Hope you have a wonderful Thanksgiving and we appreciate you taking the time to share with us at Snickerdoodle Sunday! YIPPEE! thank you ever SOOO much Laurie! :>D! too adorable! 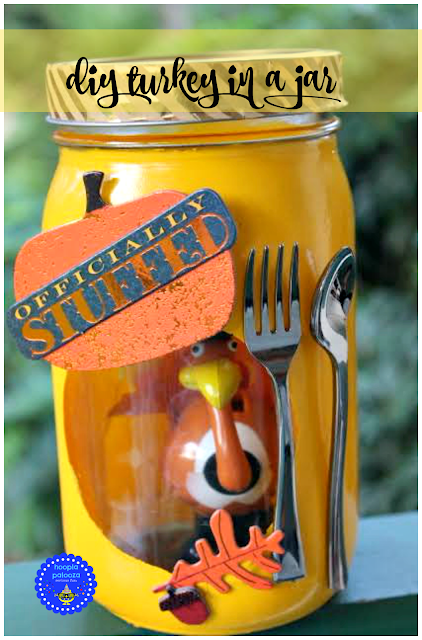 how fun and lovely is this turkey in a jar?!?!? You are very creative! This little guy is adorable peeking out of the jar. Love how you decorated it. Super cute! Bet you will get lots of compliments on him Thanksgiving!
" why's everyone looking at me" made me LOL - too cute for words !!! thank you Susan hehe! i'm so happy you get my silly sense of humor! :>D! I love everything about this! So cute! I love the stickers (I have a thing for stickers) and the silverware. Too cute!!!! I'm pinning this to my Thanksgiving board! Thanks for sharing at Submarine Sunday!! !